Can Tho - Hau Giang Cement Co., Ltd is a subsidiary of Can Tho Minerals and Cement Corporation (Cantcimex Group) - a leading cement producer and trader in the Mekong Delta. Right from the beginning, Can Tho - Hau Giang Cement Company managed to create the best, most competitive products and ideal customer service. After nearly 10 years of operation, Can Tho - Hau Giang Cement-branded products of high and stable quality have been now widely used in many industrial and civil construction works in the Mekong Delta and reached out to other markets where they are highly appreciated by customers. At present, Can Tho - Hau Giang Cement Company has successfully manufactured a variety of cement products such as PCB40, PCB50, PC40, PC50, sulphate cement and cement deep mixing, to effectively meet diverse construction market needs. In addition to supplying cement products branded Can Tho - Hau Giang Cement to construction sites, the company also invested in a fresh commercial concrete production line with an hourly capacity of 120 cubic metres catered for civil and industrial constructions. Its products include precast concrete such as concrete piles and autoclaved aerated concrete (AAC) like 8x18 and 8x19 hollow bricks and 20x10x60 four-hole block bricks. The company’s products are made by wholly automated modern machinery and technological lines imposed under strict technical process and input and output quality control and management. Striving for effective, sustainable business and environment-friendly cleaner production, Can Tho - Hau Giang Cement Company has applied ISO 14001 quality management standards for a green, clean and fresh environment. This is also the reason why Can Tho - Hau Giang Cement Company is highly appreciated by consumers and becomes a trusted companion of all constructors. By the end of 2017, the company’s cement consumption reached 50,000 tonnes a month. Its distribution network has been expanding, with more than 25 distributors from Binh Thuan to Ca Mau to supply cement for southern markets and the national market as a whole. To further develop and secure a stronger footing on the increasingly competitive construction material market, prestige, product and service quality remain optimal solutions. Not only having high and stable quality and suitable property for climate in the Mekong Delta, the company’s products are also integrated with superior features such as anti-erosion in saline and alumic environment, augmented elasticity and ease of use for industrial, civil, watering and transportation projects. Besides product quality, Can Tho - Hau Giang Cement Company has attached great importance to building up a strong consumer confidence by offering perfect service quality and after-sales policies and promoting customer care and consulting services. Accordingly, in addition to fast and convenient delivery procedures around the clock, the company has applied flexible promotional policies and discounts to customers and, at the same time, conducted customer surveys on its strengths as well as its weaknesses to have self-improvement policies. General Director Thai Minh Thuyet said that, not only competing with domestic cement producers, Can Tho - Hau Giang Cement Company also faces other types of competitors. 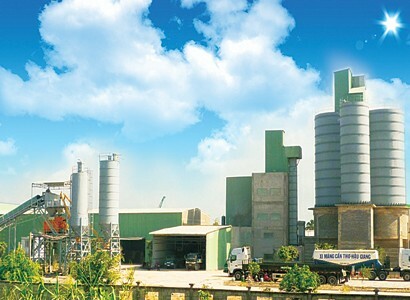 In that context, to effectively compete and increasingly assert its market position, Can Tho - Hau Giang Cement Company will constantly renovate its technology and management process to ensure outstanding product quality. The firm regularly organises conferences and seminars for distributors and agents to learn their opinions on product quality, price, modes of transport, and information about competitors to devise the right development strategies to unlock its inherent strengths. In addition, the company pays attention to improving service quality, both before- and after-sale, launching reasonable sale programmes, customer care programmes and product warranty programmes to increase added values. “Can Tho - Hau Giang Cement Company always places customer interests on top through the principle “Sell what customers need, not sell what we have” and constantly strives to serve customers at anytime, anyplace to effectively and timely respond to customer requirements for products,” he confirmed.